I’ve been fabricating Formica products for many years in the kitchen cupboard and counter industry. Plastic laminate worktops can last a lifetime if they are built, installed and cared for properly. In this article, we will be looking at all three of these factors to help you understand how to best select and maintain your worktops. What materials are best for the tops to be fabricated from? There are two types of board that are used for fabricating worktops, particleboard and plywood. For years people have had difficulty with press-board because it absorbs water and swells. Lowe’s countertops and other super centers usually have flake-board cores. The stock items are called post-form tops. These generally have the rolled-over front edge and the backsplash that is preformed into one piece with the deck of the top. This material is used for several reasons, but mainly because it is the cheapest choice. Plywood worktops can only be obtained through having your counters custom built. The advantages of having plywood tops is that they are much more water-resistant than the particleboard styles. How do you protect from getting water damaged counters if you have flake-board as the core? 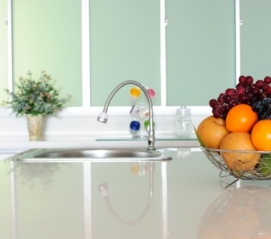 There are three ways to protect your press-board worktops. When they are installed, all of the seamed areas (miter joints) must be sealed with caulking. I am not just referring to the joint after the tops are installed. I am also referring to the edges of the particleboard where the seam will be prior to them being fastened together. Everywhere there is any type of gap that would allow any water to seep onto the core of the worktops needs to be sealed with caulking. This does not have to be a huge bead of sealant, but it does need to fill the cracks along the walls one hundred percent (100%). All around the sink needs to be sealed with the caulking really well. When the sink is installed, the plumber must use plumbers putty underneath to protect against any water reaching the inside edge of the sink cutout. The bottom edge of the Formica kitchen worktop that rests the cupboards (overhangs the face of the cabinets) needs to be sealed with either paint or Thompson’s Water Seal. The very least you should seal is all around the dishwasher area. This is where a lot of steam/moisture rises and can ruin your plastic laminate counters in this area. How Do I Care For Formica Worktops? The best cleanser I’ve found through the years for plastic laminate worktops is glass cleaner. It seems to cleanse the Formica worktops really well and leaves them streak-free. The one thing you never want to do is bleach your counters. Clorox Bleach is way too strong of a cleanser to use. If you have a high-gloss finish, the best product I’ve ever used is called “Countertop Magic.” Cleaning Formica countertops with a damp cloth works fine too. If you have a mitered seam area on your worktops it is a good idea to periodically wipe caulking in the area. Plastic laminate seams can have a tendency to separate a little over time. This is due to the expansion and contraction of the worktops and the kitchen cupboards underneath. As the conditions of the climate change from season to season, anything made out of wood shifts and moves. When you take time every now and then to re-caulk areas, you will be protecting your Formica worktops from the possibility of getting water damaged. Just so you know, of all the choices on the market these laminate counters are the cheapest kitchen worktops.